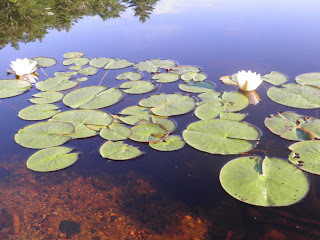 The time of summer is now upon us when waterlilies are in bloom. There is not much more magical than canoeing in early morning through the mist and coming upon a colony of these white, ethereal beauties. I can remember like yesterday one such occasion when I was canoeing on the lake where I grew up. I was quite small at the time and it really made an impact. These were close enough to shore for me to photograph! Water lily flowers are extremely showy and fragrant but each bloom only lasts a few days. It’s a shame that most of us (those without boats) can only admire them from afar, as they are even more beautiful when seen up close. Nymphaea odorata blooms are about 5-6” across and almost pure white. Some flowers are pink here in Nova Scotia, although in the wild they are rare. 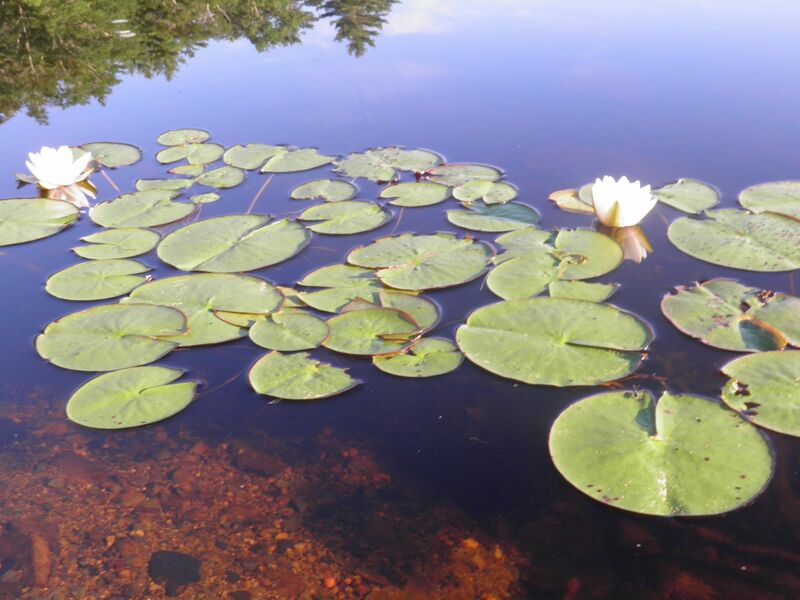 The blossoms and oval leaves float on the surface of the water on stems that are slightly longer than needed to reach the bottom of where they grow. Different Nymphaea species grow world wide and are present from temperate regions through to the tropics, both north and south. Nymphaea have an unusual way of becoming pollinated. When the blooms open they excrete a little fluid that collects at the bottom of the flower. When insects visit the flower they are directed past the pollen and down to the base. The pollen “washes” off them when they are in the fluid. Most often the insect escapes, although some do get stuck and drown. After the blossom is pollinated the stem tightens and draws the bloom underwater where the berries develop. When ripe, up to 2,000 seeds are released from each berry. The seeds float and are dispersed by currents or aquatic life. They then become waterlogged, sink and sprout. 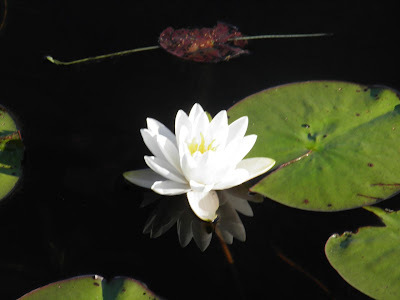 Waterlily is not without its “culinary” uses. Native Americans made flour out of dried roots. The young leaves and flower buds were eaten as vegetables and the seeds eaten toasted. Natives also used the plant medicinally. Mashed green roots were used as poultice for swollen limbs; the roots for problems of the womb, digestive problems, a rinse for mouth sores; leaves and flowers as cooling compresses. 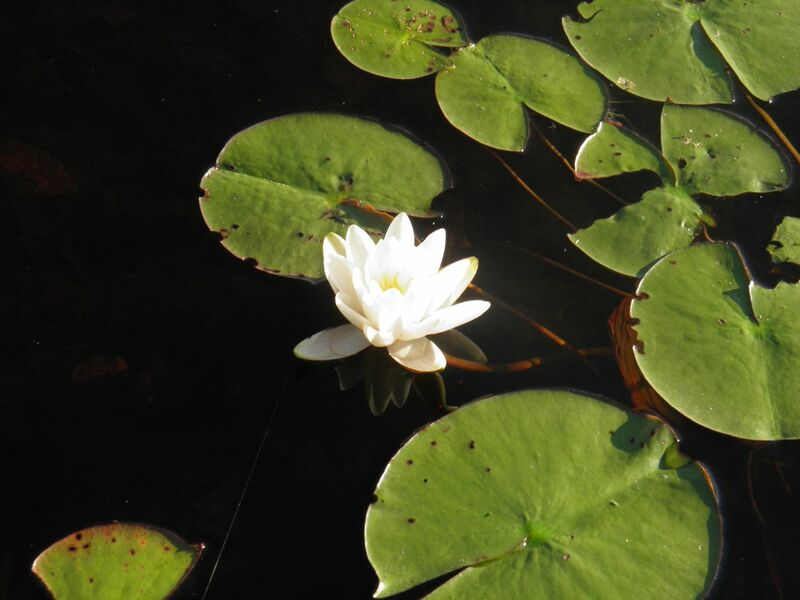 If you have a water feature you can purchase many varieties of waterlily in local garden centres. Lots of different colours are available from which to choose. But I do have to admit that nothing is as stunning as gliding through hundreds of blooms in the morning mist.